Some customers say they would have liked it to be wider, aesthetically wise. The piano has always been the most admirable instrument of all times. It depicts a high-class and considered grand. So, the all new Casio Privia PX-870 Digital Piano, brings back that nostalgic experience to you. It is big and the frame is made using pressed wood that gives it a nice texture and adds to the beauty of the design. This has the perfect vintage looks with a digital interface that makes it an ideal piano for modern piano enthusiasts. Casio has done a great job on design, features, and performance that makes it, probably, the best in the market. 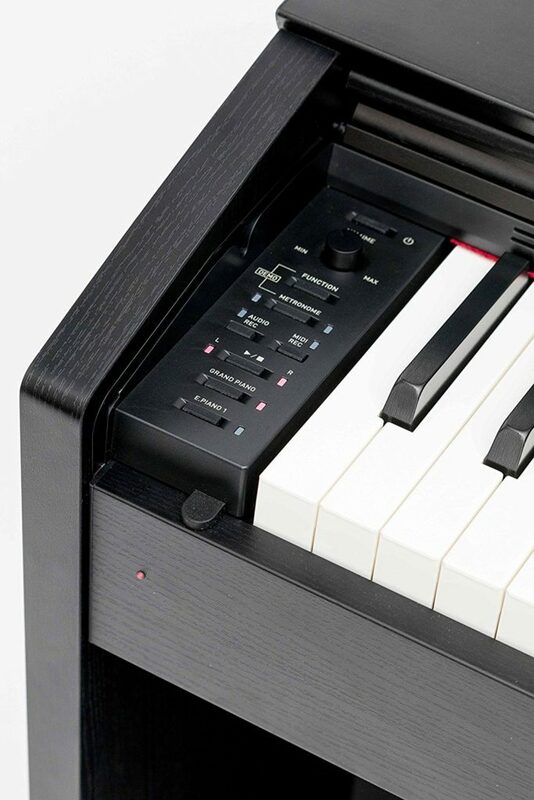 The Casio Privia PX-870 digital piano comes with four speakers with 20w of power each that are placed in four different areas of the piano. It delivers a crisp and clear sound with surround effect that is as good as a grand piano. Thus you can experience realistic effects with a wide dynamic range. So it easily fills a large room without requiring external speaker systems to be connected. However, it does support connecting with large speakers if you are playing in a concert hall. So the piano comes with two 1/4 inches jacks that can be used as lineout for your external speakers or amplifiers. You can even connect a headphone if you want to practice in private. The key benefit of this PX-870 is the ability to choose from various modes to play. It has a dual mode that lets you layer two sounds at the same time for a simultaneous play. This feature allows you to combine piano with harp, strings and various other sounds that you like. There is a split mode that lets you divide the piano into two different sections to play different sounds at the same time. So you can exhibit a much more enhanced music skill to your audience or family and friends. The third mode in this piano is the duet that divides the keyboard into two separate pianos with similar octave ranges. So this is ideal for teachers to effectively teach their students how to play. You do not have to really have a second piano if you want to teach someone to play piano. The Casio Privia PX-870 Digital Piano comes with 60 songs preloaded in it and you can listen to them and practice. You can even upload up to ten of your own MIDI songs that are easily available for download on the internet. So, learning to play your favorite tune is made easy on this piano. It has a USB type B port that lets you connect your computer to upload and download the MIDI tunes. It even supports USB pen drives for the same purpose. 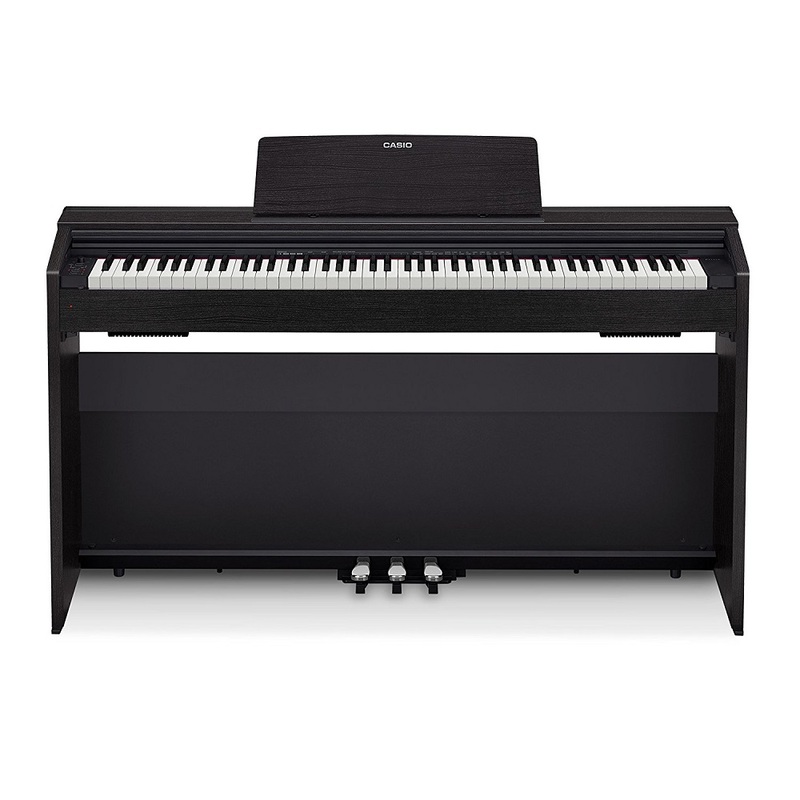 The Casio Privia PX-870 Digital Piano comes with three pedals for soft, sustain and sostenuto. There is a control panel on a side over the keyboard that lets you control volume, recording, sound functions, power button, playback, etc. It also comes with a built-in keyboard cover that protects the piano from damage and dust. Overall, this piano is best suited for beginners as well as pros and delivers high-quality performance. So it has everything you need to become a great pianist of your generation.